Many of you have travelled on coastal steamers, and watched the gulls as they swoop around the boat. 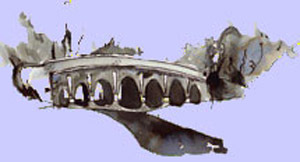 Flying, further away and often on a parallel track you see small dark grey birds, with bullet shaped bodies, and fast flapping wings. What you are seeing are guillemots. Guillemots spend most of their lives far out at sea, often in rafts with hundreds of other guillemots, diving now and then for fish. Guillemots keep well away from people - you’ll never see them in town! They only come to land to breed. They seek sea stacks, or small steep islands, where they are safe from meat eating mammals. They lay a single green egg on a narrow ledge, shared with other guillemots. The egg is pear shaped, so that it rolls in a small circle, and is less likely to fall over the edge. Even on their remote resting sites guilletmots have enemies. Ideally one parent remains at the nest to guard the egg or chick, while the other looks for fish, but because of falling fish stock, often both parents have to leave the chick to seek food. And that is when gulls and fulmars take chicks. Because of their vulnerability, baby guillemots leave their nests before they are able to fly. They leap from their ledge, with wings flapping, and legs spread wide - to land in the water and join the thousands of other baby guillemots and their parents as they swim to the nearest fishing ground. seeing other chicks as competitors with their own chicks? Guillemots resemble penguins but are rather smaller. They have dark grey heads and backs, and their under body parts are white, which makes it harder for fish to see them. Guillemots have large legs, which help them swim fast. 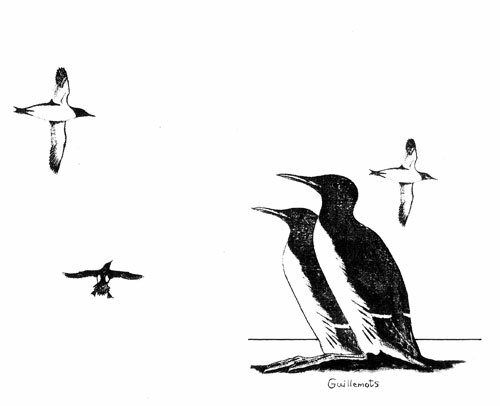 Guillemots and penguins are not related. Penguins are birds of the southern hemisphere. The most northerly penguin colonies are in the Galapagos Islands. The similarity of penguins and guillemots is due to divergent evolution - where animals with similar lifestyles develop similar appearances. Guillemots are members of the auk family. The most famous member of the auk family is the puffin. All auks are under threat. Global warming means the fish they pursue are moving northwards, and auks are having to seek new nesting sites, which are not necessarily available. Again, over fishing is reducing fish stocks. Already one member of the auk family, the flightless Great Auk has become extinct through hunting. It would be a shame if other members of the auk family were to succumb through man’s activity - but it is a possibility.